You may have visited St Lucia before or perhaps it’s next on your list of dream Caribbean getaways to explore, but how many of you have considered a twin-centre holiday on the island? Arriving into Hewanora airport after the seven hour flight, the first thought is to get to your hotel, and for the majority of visitors this means heading straight up to the north west corner of the island. Perhaps you’ll head back south on a day trip to view the Pitons or drive down and discover La Soufriere volcano or to experience the fabulous dive sites, but what better way to enjoy this stunningly beautiful part of the island than to stay a few nights and soak up the beauty as you sit at your balcony or by the hotel bar. So, where to stay? Views can come at a price but in any destination I can almost guarantee that for every collection of luxury resorts or boutique hotels that boast the best, there’s a moderately priced alternative. Now, I like a little luxury every now and then, especially when it comes with a local twist, and the resorts of Anse Chastanet, Sugar Beach, Ladera and Jade Mountain provide just that in varying degrees. Some have butlers to cater to your every whim, some are more modest, boutique options, but all offer a view and a sunset (or sunrise) to die for. Can you experience all that for less than £100 a night – sadly no. But as I said, for every slice of luxury there’s a gem hidden in the wings waiting to be discovered – and that’s Stonefield Estate. As you head down the track which forms the entrance to Stonefield, you could be forgiven for wondering where on earth you’re headed. Once you reach the comforts of your room you will see why this place is so special. It’s not all-inclusive, it has no luxury dining options, no butlers, and no beach, but it has the view – and the perfect verandahs from which to savour it! Stonefield is also a great pick if you fancy a self-drive and want to get out and about – It’s just five minutes drive from Soufriere – so easy access to the local supermarket, which leads me quite neatly onto another great option which very few holiday makers seem take up here – car hire. As with driving in any other country, familiarity can go a long way when it comes to exploring under your own steam and when it comes to St Lucia I would recommend this for a second timer to the island. Anyone reading this who has been before will know the roads take some getting used to so it’s best to know what to expect! If you fancy giving it a try though you won’t be disappointed and can really get into the heart of the country in your own time. The key point here is that you shouldn’t miss out on the true beauty of St Lucia because you don’t have the cash or the time. 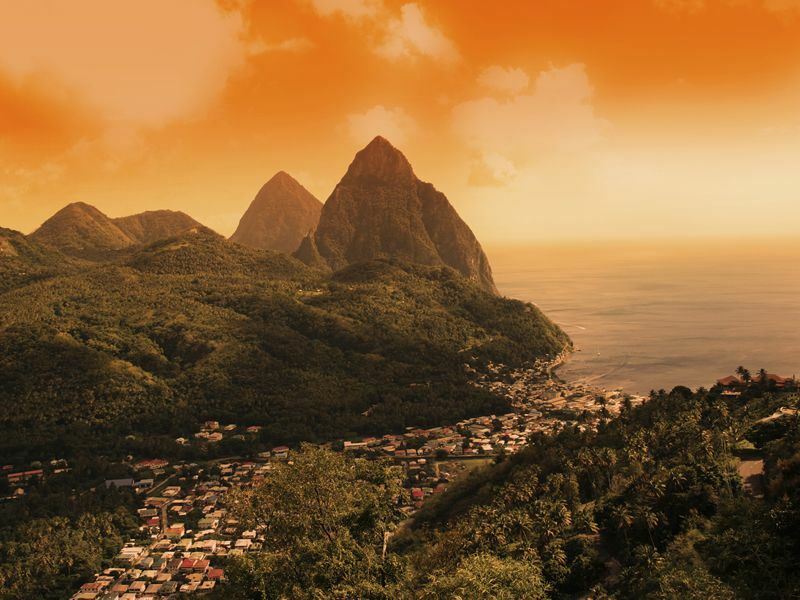 Just take a few days to explore and discover the stunning south, do all the excursions on your list – climb the Pitons, visit the ‘drive-in’ volcano and get into the heart of the island and I’ll bet you’ll save both. Then head north to your beach resort and just chill. Whether you opt for an all-inclusive resort to soak up the sun and say goodbye to the world for a while, or choose to stay in the heart of Castries or Rodney Bay and one of the many great B&Bs (several of which have all-inclusive options) you can be assured of one thing – you’ll have the most amazing memories and very best photos from which you can relive the stunning sights of the spectacular south over and over. As for those pitons – one day I will climb them, but for now — admiring them from a comfy lounger with a Piton beer is just fine! Article written by Mags Longstaff.